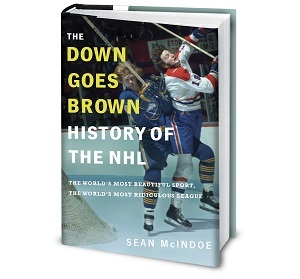 Down Goes Brown: Sundin's move sends a strong message to the kids... unfortunately. Sundin's move sends a strong message to the kids... unfortunately. Those who are trying to spin Sundin's decision as a Good Thing have thrown various ideas against the wall. One of them is that Mats is sending a powerful message to the team's young players about loyalty and leadership. On the surface this makes some sense, but I wasn't sure. Luckily, with the Leafs currently holed up in an Ottawa hotel before tonight's game, I was able to sneak over and infiltrate their team lunch and listen in to a conversation between Mats and the young players. Here's the undedited transcript. I think it sheds a lot of light on the direction the team will be heading. Scene: A private booth in the lobby restaurant of the Brookstreet Hotel, Kanata, Ontario. Steen: Uncle Mats, the newspapers say you turned down a chance to go to another team for a "playoff run". What are the "playoffs"? Sundin: Gather 'round, children. I have magnificent tales to tell. Stralman: Are the playoffs very different from the regular season? Sundin: Yes, they are. For example, you play the same team over and over again. For like two weeks. It's actually kind of like we do once a year with the Bruins, but for two straight months. Tlusty: Is it true that the games are all... how you say in english... "important"? Sundin: Please put your pants on Jiri. Sundin: But yes, the games are very important. Remember that one game we played at the end of last year against the Habs, where it actually mattered whether we won or not, and we all agreed to at least kind of try? Sundin: Well, in the playoffs, every game is like that. Sundin: I can't understand you Kyle. Finish the donut and try again. Wellwood: Forry. (Gulp.) Is it true that there are no shootouts in the playoffs? Sundin: Indeed. In the playoffs, if you want to skate in slowly and indecisively and then miss the net, you have to do it five-on-five. Sundin: And here's the most amazing thing. You know how we go on losing streaks all the time, and nobody does a thing, and nothing ever changes? Sundin: Well, in the playoffs, if you lose four games out of seven, they make you go home. Sundin: They make you clean out your locker. You're not allowed to play any more. Steen: Oooh, I don't like the sound of that. Stajan: I just peed a little. Sundin: Oh, don't worry boys. You play for the Maple Leafs. You won't have to worry about those scary "playoffs" for a very long time. So my advice would be to just negotiate a big contract, don't forget your no-trade clause, and settle in for the long haul. Winning's over-rated. Staying all snug and warm in your personal comfort zone is the important thing. Everyone: Thanks Uncle Mats! Now we know what it means to be a Maple Leaf! I need to come here more often.